At the farm we raise pigs, chickens, rabbits, and Chianina cattle. The latter, which is at risk of extinction, has a special connection with our family, since the three Fioroni brothers have always bred Chianinas. The meat of this breed is of superior quality, delicious and extremly rich in nutritional values. We dedicate special care to our Chianina cattle in order to preserve all these qualities. We use a closed breeding program, meaning that Chianinas are always born in the farm through artificial insemination, and that we do not buy outside cattle. Their diet consists of completely organic, home-grown pasture and flowers. Of course, they also have plenty of fields to graze in. We sell our Chianina meat only with a reservation. Meat is butchered and sold about twice a month. 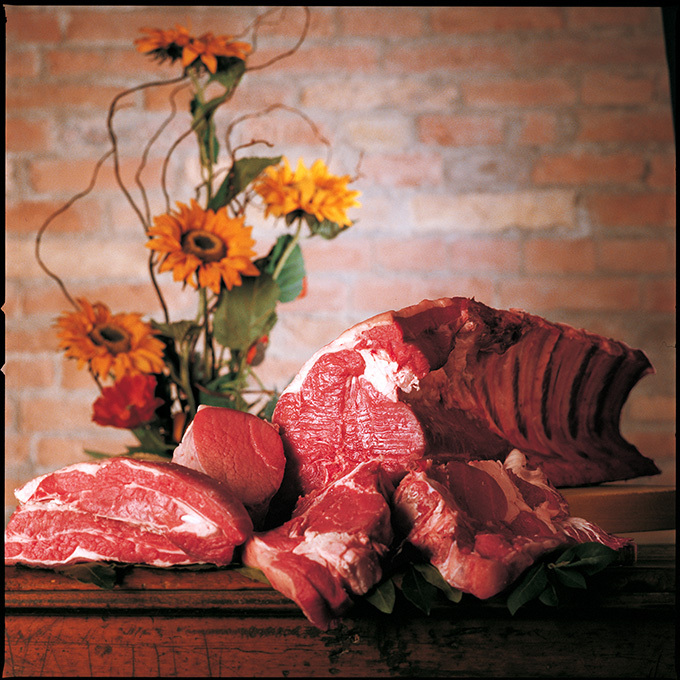 Our meat package consists of different cuts of meat, about 12 or 13 kg, and it is vacuum sealed for freshness.